The sharp rise in home prices in 2013 caused two conflicting results: The return of positive home equity for hundreds of thousands of borrowers and considerably weaker affordability for an equally large pool of potential homebuyers. While positive equity allows more borrowers to move, weaker affordability keeps them in place. So which will be the greater driver of housing this spring? "There's going to be a reality check in the spring in terms of realizing that what we saw in 2013 is not a real market," said Daren Blomquist of RealtyTrac, a real estate sales and data website. "It's a nice bounce-back market, but ultimately you need the biggest pool of potential homebuyers out there to be able to afford those homes." In an analysis of housing affordability, RealtyTrac found that the estimated monthly house payment for a median-priced, three-bedroom home purchased at the end of 2013 was a whopping 21 percent higher than it was at the end of 2012 in more than 300 U.S. counties. That includes mortgage, insurance, taxes, maintenance and the subtracted income tax benefit. The rise is the result of higher home prices and higher mortgage rates. RealtyTrac used a 30-year fixed-rate mortgage with an interest rate of 4.46 percent and a 20 percent down payment. That is versus a 3.35 percent interest rate the previous year. Some metro regions, especially in California and parts of Michigan, saw monthly house payments rise about 50 percent from a year ago. "Home prices were boosted by cash buyers in 2013, and as the cash buyers move out of the market in 2014, the buyers left are not going to be able to afford the home prices as readily in some of these markets," added Blomquist. It will now take far higher incomes in these markets for potential buyers to afford a purchase. In Los Angeles County, for example, the minimum qualifying income needed to buy a median-priced home is now more than $95,000, compared with about $68,000 a year ago, according to RealtyTrac. Income growth in the U.S. has not been robust to say the least in these last few years. While it is still cheaper to own than to rent in the vast majority of U.S. housing markets, the scales have tipped the other way in some major metros, like Seattle, Los Angeles, San Francisco, Chicago, Denver and Suffolk County, N.Y. (the Hamptons). The 29 counties where RealtyTrac found it more expensive to own than rent account for 20 percent of the population of the 325 counties it analyzed. The good news, perhaps, is that home price growth is moderating. 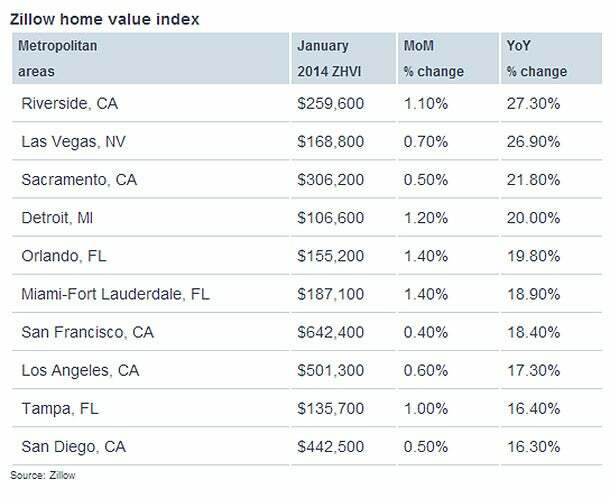 National home values rose just 0.2 percent from December to January, according to a new report from Zillow. That is the smallest monthly increase since May of 2012. This may be due to a rise in inventory. While real estate agents still report tight supply, Zillow says it saw an 11 percent jump in the number of homes listed on its site in January, on a seasonally adjusted basis. "As the market shakes off a long winter and gears up for the spring season, we should see buyers gaining a bit more leverage this year than they've had in the past, with more choice and less competition," said Zillow's chief economist, Stan Humphries, in a release. "This slightly more balanced market is another step on the road back to normal, and will help offset the impact of rising mortgage rates and more expensive homes for buyers." The inventory jumps, however, are largest in the formerly hardest hit areas, where investors depleted the distressed supply during 2012 and 2013. Phoenix, Las Vegas and Sacramento, Calif., are all seeing major increases in supply, but still lackluster sales, as investors have now priced themselves out of the market. It remains to be seen if there is enough regular demand from buyers using credit.